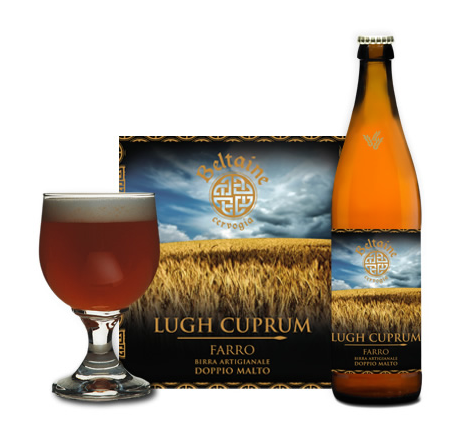 La Lugh Cuprum birra doppio malto al farro dal colore ramato, 5,6° alcolici. Presenta una schiuma bianca, compatta e persistente. Aroma intenso, morbido con note di erbaceo e agrume. Il gusto si presenta amaro persistente, con sapore di crosta di pane bianco, paglia e fieno. – Ingredienti: acqua, malto, farro, zucchero, luppolo, lievito.Il farro proviene dal nostro Appennino. – Gradazione alcolica: 5,6% vol. alc. – Bicchiere consigliato per la degustazione: ampio a coppa. – Momento consigliato per la degustazione: Unica come aperitivo e per un pasto insieme ad amici vegetariani. – Il birraio la berrebbe con: cibi sostanziosi, ideale con contorni di verdure e formaggi mezzani. Lugh is a spelt beer, typical of the Celts, who used to drink “Lugnassad” during the important harvest festival , to thank the Earth for her gifts. Lugh was the god of the sun and of the fertility of nature, of intelligence and of all human abilities: his lance always ensured victory. All the rites devoted to Lugh were intended to obtain rich harvests, a guarantee of survival during freezing winters. Among all their harvests, the skilled Celt farmers had a preference for the spelt, a cereal which adapted very well to cold climates and heights, from which they were told to produce a beer giving immortality. Organoleptic description: not-filtered double malt beer, re-fermented in the bottle, not-pasteurized, amber-colored. White, thick and lasting froth. Intense, smooth flavor, with herbaceous and citrus features. Persisting bitter taste, similar to white bread crust, straw and hay. Ideal with rich food, vegetables and mature cheese. Ingredients: water, malt, spelt, sugar, hop, yeast. To produce Lugh only local varieties of spelt are used, from the organic farming of “Montagnamica”, still deeply rooted in the traditions of the highlands, particularly linked to spelt cultivation.